The Basin Characterization Model (BCM) dataset provides historical and projected climate and hydrology data at a 270 meter resolution, which is relevant for watershed-scale evaluation and planning. These data have formed the basis for multiple research projects and vulnerability assessments applying climate change projections to conservation decision-making, providing a common base-layer and set of assumptions across these projects. For assistance, send us an email at team@climate.calcommons.org. The original BCM for California was based on a southwest US product (Flint and Flint 2007), and refined for the California Energy Commission PIER working group effort. This model relied on 4-km spatial resolution climate data from PRISM, the original southwest US maps of national soils (STATSGO), and a regional snow and potential evapotranspiration calibration (see Flint and Flint 2007). This model had a suite of basins that were used for calibration to calculate basin discharge and compare it to measured streamflow to develop statistics across the state and evaluate relative uncertainties in model performance. Future climate projections used in the hydrologic response to future climates for this version of the model were 4 projections (2 models, GFDL and PCM, and 2 emissions scenarios from CMIP3, A2 and B1) that were bias-corrected to the 4-km PRISM historical climate and applied to the BCM. The revised modeling for the CA-BCM described in Flint et al. 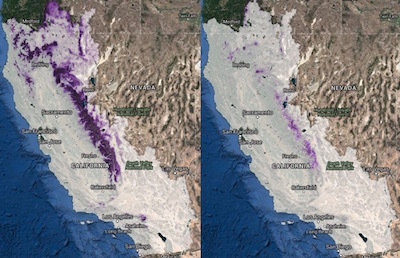 (2013) includes the updated 800-m spatial resolution climate data from PRISM, the county level soils data (SSURGO) for the entire state, and more rigorous snow and PET calibrations for California. This dataset included updates to all the basin calibrations as well. The future climate projections included the original 4 projections that were revised with bias-corrections to the 800-m historical PRISM climate, plus an additional 3 projections from the CMIP3 dataset (IPCC 4th Assessment Report) and 11 projections from the CMIP5 datasets (IPCC 5th Assessment Report). These projections included a range of emissions scenarios and representative concentration pathways. All projections were processed by the BCM to provide hydrologic response to 18 future climates. Watershed Mapping Committee; CalWater 1999). The estimate of spatially distributed runoff does not equal basin discharge as measured at a streamgage without post-processing to determine the components of runoff and recharge that contribute to stream channel gains and losses, which must be done using some measured data for a given basin. 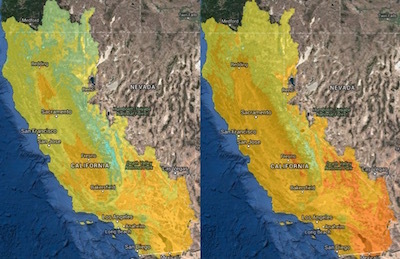 The resultant parameters corresponding to the gains and losses generally reflect climatic conditions and geologic setting, but at the scale of California have not been determined to a degree that allows for the direct extrapolation of basin discharge to all ungaged basins. The spatial distribution of runoff and recharge, however, provides relative differences over the region and can indicate the differences in sensitivity of basins to changes in climate. The estimates of changes in soil moisture and CWD do not rely on interpretation of bedrock permeability, and uncertainties correspond more closely with those of the mapped soil properties and climate data. Because the BCM model outputs are calculated on a grid-cell basis, results can be summarized across landscapes using summary units of any size of interest such as watersheds, ecoregions, or political boundaries. The ability to spatially project hydrologic model outputs permits the cross-comparison of these landscape delineations, with mapped outputs of interest to various fields of research. Maximizing evolutionary potential under climate change in southern California protected areas. Downscaling future climate projections to the watershed scale: a North San Francisco Bay Estuary case study . See also this Video interview with Dr. Lisa Micheli explaining the research and results. Targeting climate diversity in conservation planning to build resilience to climate change. Why So Many Climate Models?